This post is from the small Cheshire village of Bosley where I had received an enquiry from the owner of the old station master’s house. The house was quite old and the owner had been modernising it whilst keeping many of the original features. This includes some fantastic Terrazzo kitchen tiles which unfortunately were not looking their best due to an abundance of ingrained dirt. 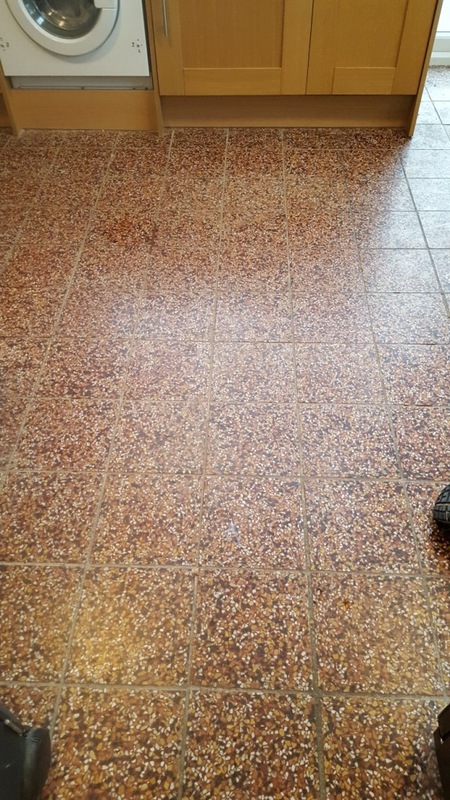 The floor was well overdue to be restored by a professional, so we were called in to get the job done. Terrazzo is a very hard wearing and affordable material that was quite common in many public buildings so I suspect this floor was original. Terrazzo is very hard wearing so we find the best method to clean them is to treat them like a Marble or Travertine and use a process we have developed called ‘burnishing’. This process cleans and polishes the tiles using a system of four 17″ diamond-encrusted burnishing pads of varying grits in conjunction with a little water as lubrication. We started by applying the Coarse 400 grit pad to grind away the stubborn ingrained dirt, a little water is used to lubricate and then the floor is rinsed to remove the slurry that is generated. We then worked our way through the system to a Medium 800 grit pad, Fine 1500 grit pad and finally a Very Fine 3000 grit pad each one applied in the same way. This process carefully refines the polish of the surface of the tiles, restoring shine and lustre while ridding the stone of ingrained dirt. Once the burnishing had been completed, we gave the floor a thorough rinse to remove dirty water and soil residue the floor. It was then left to dry overnight. 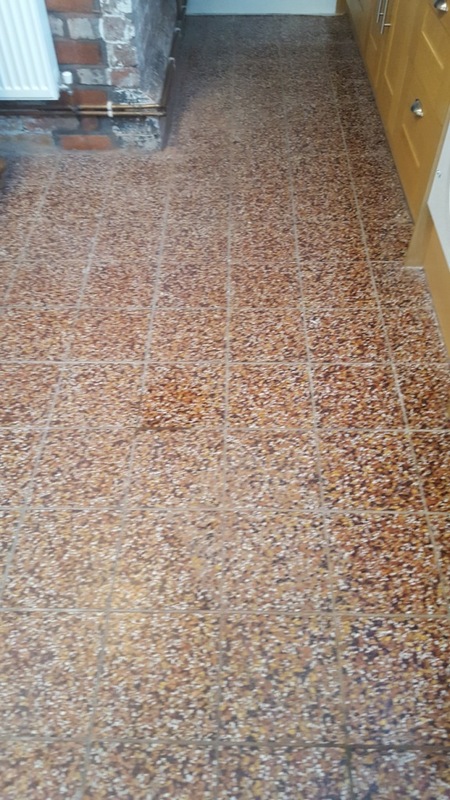 The floor had dried by the next day, so the tiles were ready to receive a fresh seal to protect against ingrained dirt and make them easier to keep clean in the future. 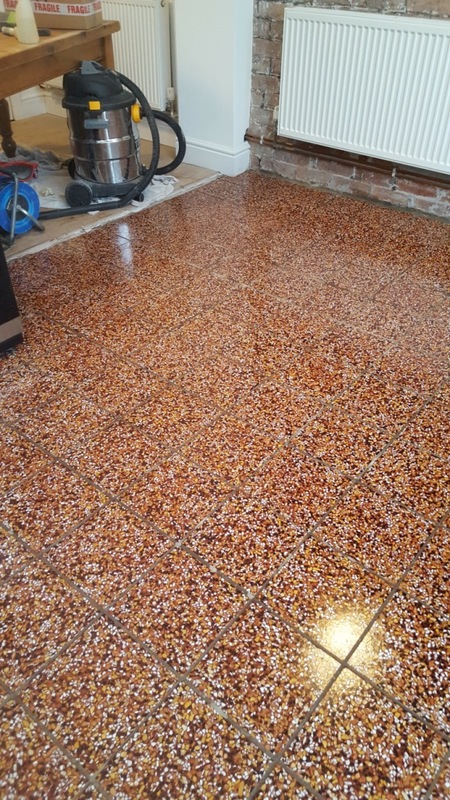 Our choice of sealer for this floor was Tile Doctor Colour Grow, it’s an impregnating sealer that’s specially formulated to enhance the natural colours in the tiles. As an impregnating sealer, Colour Grow fills the pores in the stone to act as a barrier against muck. Before we left the customer to enjoy their newly restored Terrazzo tiles, I made sure to use a rotary machine fitted with a white pad to gently buff the floor and make sure the finish was pristine. 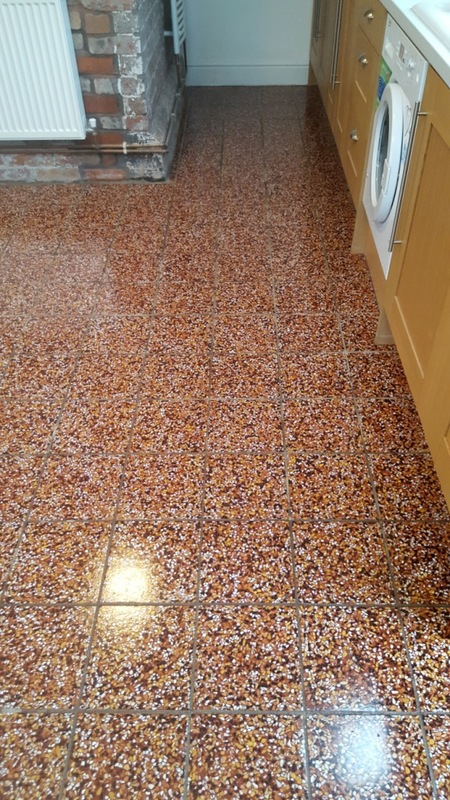 This entry was posted in Terrazzo Posts and tagged bosley, east cheshire, kitchen, terrazzo tiles, tile cleaning, tile sealing by AbzDominise. Bookmark the permalink.